Submitted by akreider on Tue, 09/02/2014 - 18:03. An estimated 30% of Philadelphia residents have not applied for the homestead exemption which exempts the first $30,000 of a homeowner's property value from taxation. This can save you $402/year if you get the full exemption. The city created this program to take some of the bite out of the property re-assessment (Actual Value Initiative) which increased residential taxes and decreased taxes for the large commercial properties. 2014 is the first year that the Homestead Exemption and new valuations apply. I made this map of applications based on the Office of Property Assessment April 2014 data set. I've organized a small canvassing project with the West Philly Socialists to let people in the lower income part of my neighborhood know about the exemption and encourage applications. The deadline is Sept 13, 2014 - so we only have enough time to canvas a fraction of the the 5000+ properties that are likely qualified in my zip code. Based on my extremely short experience canvassing, I'm estimating 10-30% of the properties who haven't applied (and listed on my map as "qualified") are either renters or unoccupied houses. Another 10-30% might include properties that won't benefit from the exemption as they already pay zero property taxes due to the PA state rebate for low-income seniors (a Philly senior can earn up to $16,000/year in social security and qualify for a $975 rebate - or enough to reduce their property taxes to zero for a $74,000 house). And another portion of people might think that they are ineligible for the program as their taxes already fell due to the Actual Value Initiative. The goal of the canvas project is to "Serve The People". The Philly Socialists are partially inspired by the Black Panther Party and their positive programs (like the free breakfasts) that built support for their organization. So this canvas project is called "Wealth Redistribution" because we are targeting homeowners in an area with a median household income of approximately $25,000 and where the median house is worth $40,000 - $45,000. We are opposed to the regressive tax system in Philadelphia and the state of PA - which has low-income people paying a significantly higher percent of their income to taxes than the rich. Our short-term strategy is to save low-income homeowners thousands of dollars. Our medium-term strategy is to reform the Philadelphia tax system. Our long-term goal is to build an organization that can achieve economic equality (aka socialism). Assuming the Office of Property Assessment releases a second database in 2015 with homestead exemption data, we'll be able to measure our impact and estimate the number of homeowners who applied for this exemption due to our work. To make this map I combined the Office of Property Assessment data set (April 2014) with a parcels database that includes the shape of each property. Determining who is likely qualified for the exemption is tricky. The city should just make it a property level exemption and give it to everyone without requiring an application. My main criteria for determining qualification was if the owner's address was the same as the property address and they did not already have an exemption. For this map and our canvassing, I excluded commercial and industrial zoned properties to increase our accuracy. In practice, about 4000 zoned commercial and industrial properties are currently receiving the exemption as there are people who live in mixed commercial buildings (eg. store fronts) and there appear to be row houses that are zoned as industrial. I also excluded houses that are vacant or sealed off (using the exterior_condition variable). I excluded a long list of owner names that indicate that a property is owned by an investor (corporation, LLP, LLC, invest*, realty, management, partnership, etc) or church (Lutheran, Bible Church, Pentacostal, etc). My final results have approximately 128,000 residential properties that are likely qualified. I also found 10,000 commercial and industrial properties that might qualify (probably at a much lower rate). 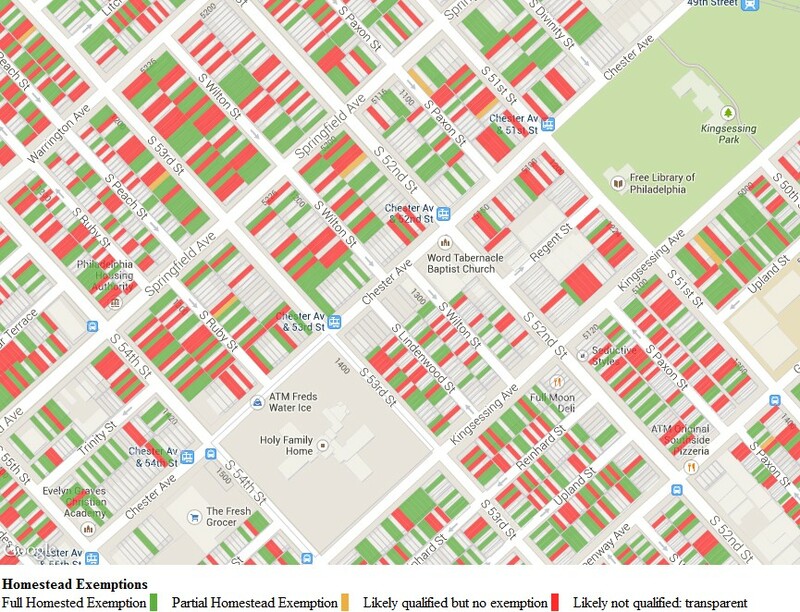 Now the actual number of qualified properties is much lower. There are about 667,500 households in Philadelphia (Census Bureau). 54.1% own their home (probably slightly lower as of 2014). So there are 306,000 renters. Now if 30% haven't applied that is 91,800. This is about 72% of my 128,000 estimate (and more likely 71% - if you allow for another 1200 commercial and industrial properties that are likely qualified but haven't applied). Now what could explain this 29% difference? I think it is primarily renters. Based on a relatively small time spent canvassing in West Philly - renters might make 20% of properties that I see as "likely qualified". The other 9% could include vacant properties that are in bad shape or just vacant due to natural causes (in a rental market a 95% occupancy rate is seen as good - so I'm guessing the rate is higher). This data set could be improved by combining it with a list of properties that qualify for the PA state low-income senior property tax rebate. If you knew how much the rebate was for a property (or by owner name), you could exclude as many as 10,000-30,000 properties from this list where the rebate already equals or exceeds the amount of property taxes that someone would owe. Alternatively, if you do not have access to that data set you could use the PA voter registration database to get the age of registered voters and find the age of the home owner. If the home owner is a senior, then it would make sense to focus your canvassing or outreach efforts on other properties - especially in low income areas where the majority of seniors will be paying zero property taxes and a minority of seniors will have their property taxes reduced by a smaller amount (and thus benefit less from the homestead exemption than non-seniors). This is the mysql query I used. I'm presenting it mostly in case someone wants to use my owner1_name logic. Submitted by akreider on Tue, 09/09/2014 - 22:27. This post has some good information on the impact of the Actual Value Initiative.